Steep tea and avoid scalding at the same time with this cooling infuser. No time to linger over your cup—or just can't wait to sip that exquisite Earl Grey? Hey, we've all been burned. This infuser cools your cup down to sipping temperature in minutes with a special core that takes away the heat. 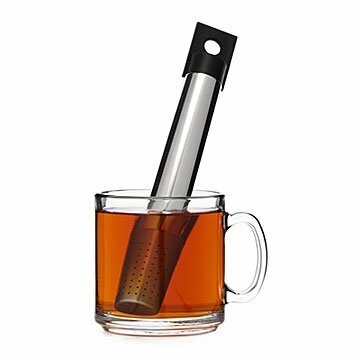 Just fill the infuser with loose tea and snap it onto the magnetic end of the stick. Then, just chill. Tea aficionados say that some types should be steeped at 200 degrees: for your mouth, that's too hot to handle. The silicone stand acts as a drip catcher to keep your tea prep tidy. It's handy for cooling coffee and other hot beverages, too. Made in South Korea. I love this product and want to buy another! This has been a fantastic purchase! I used to always have to wait 30 mins for my boiled water for tea to cool down. With this cooling stick I can easily drink it within 10. My only complaint is that the magnetic infuser portion is a bit small for certain loose leaf teas. I use this at work, but I think I will have to get one for home use now too!